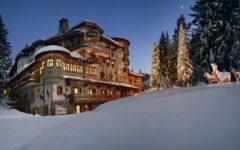 This winter the paparazzi will join the throngs of winter sports enthusiasts who head to the luxury ski chalets of Europe. They want to snap the most beautiful people having the time of their lives – and wearing the world’s best designers while they do it. This ski-style link is nothing new. As the sport developed through the 20th century it marketed itself to the discerning – and the well off – by using cutting edge imagery in its advertising. 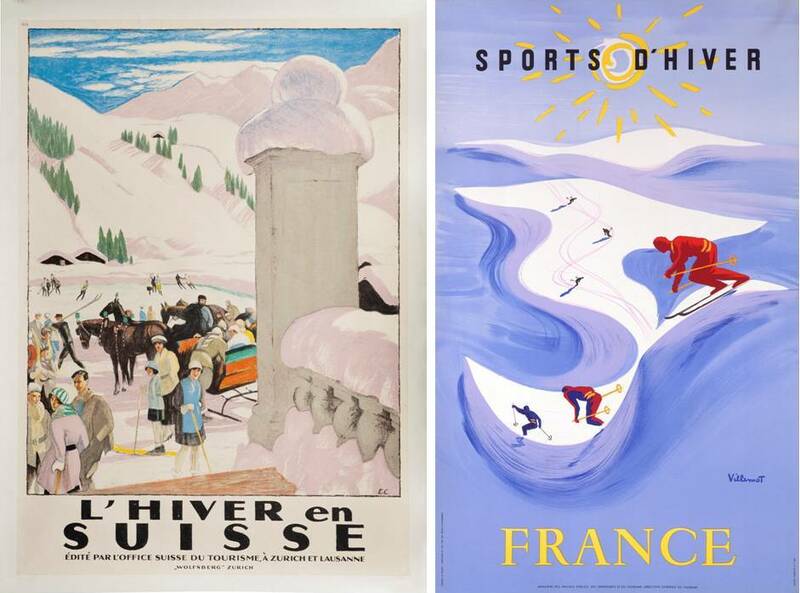 On Tuesday, 28th November, Christie’s in London hosts the latest iteration of the annual sale of ski posters it’s been holding since 1998. Finest Holidays S.L. has selected it’s pick of the sale’s images, and we hope you’ll enjoy this window on the luxury skiing world of the past. © Christie’s Images Ltd. (2) “Zermatt” lithograph by Hugo Schol, 1938. Estimate £ 5,000-7,000. 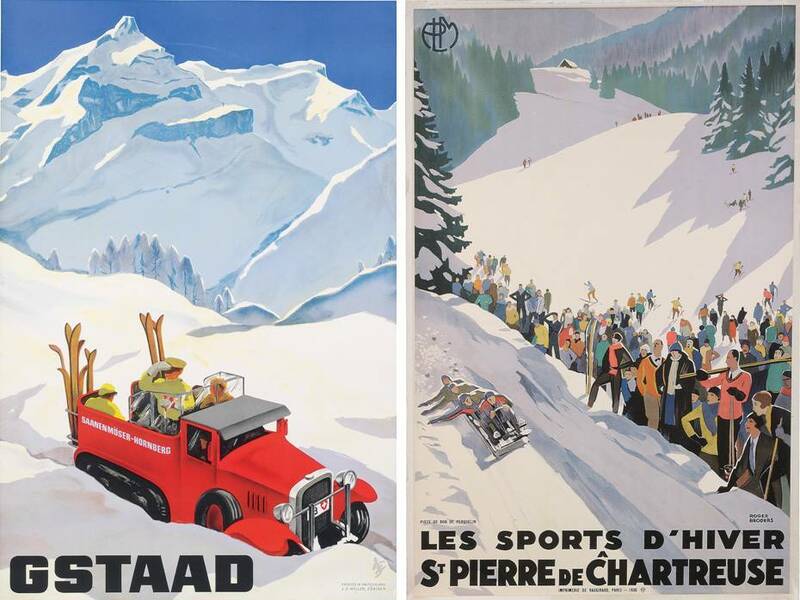 Not much is known of Hugo Schol, though he seems to have produced some wonderful ski art in his career. Zermatt in the 1930s was a resort on the up. Its status as basecamp for the Matterhorn had put it on the map in the 19th century and from 1928 its ski season was part of the established European social calendar. 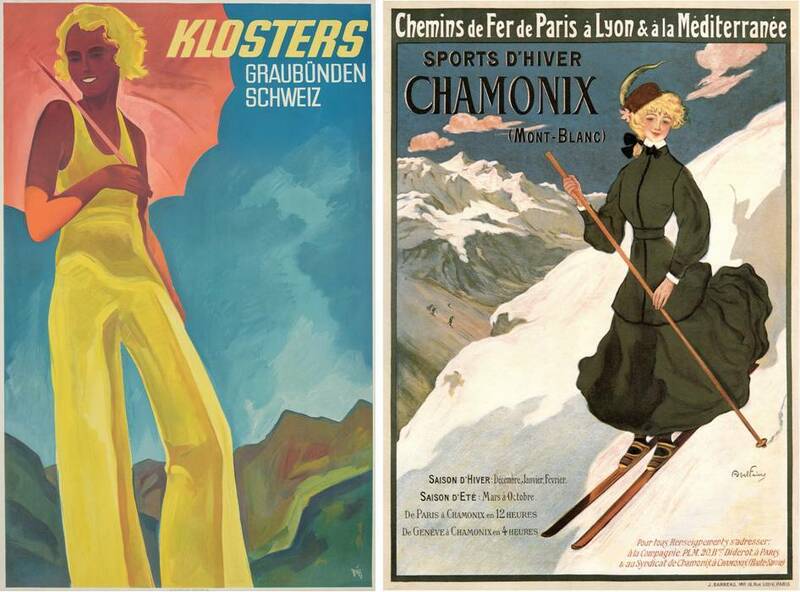 Poignantly, this poster celebrates what was the last ski season before Europe was plunged into long years of war; “St. Moritz” lithograph by Alois Carigiet, 1932. Estimate £ 6,000-8,000. Carigiet, born in Switzerland in 1902, is one of the winter holiday artists whose work has a wider importance. Check out his charming work in children’s books if you get the chance, it was good enough to win him the first Hans Christian Andersen Medal for illustrators in 1966. But before that he produced a huge number of posters from his own graphic design studios in Zurich during the 1920s and 30s. 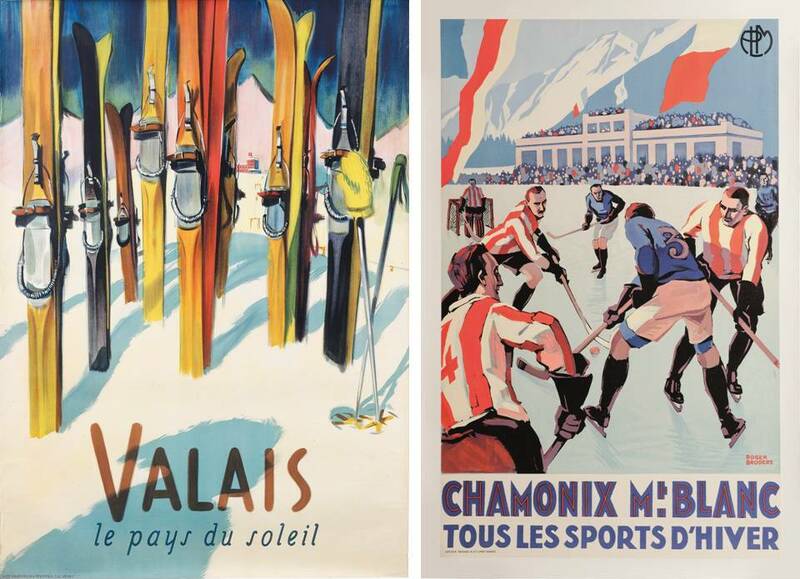 The sales offer a beautiful survey of the history of ski advertising. 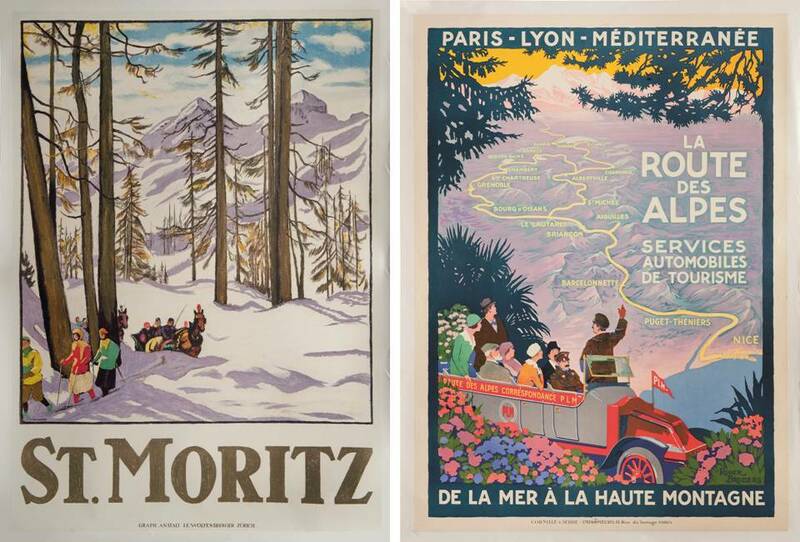 While today’s advertising imagery relies heavily on stock imagery and digital manipulation, posters from the golden age of the European ski resort include the original work by some geniuses of graphical art always working beautifully with wonderful typography. Winter tourism was a trail-blazing sector. Holidays had been for hot weather, yet here were obscure mountain villages trying to tempt large numbers of people to enjoy an obscure adventurer’s sport in the coldest places in Europe, some of which were seriously inaccessible! They sold the idea of a winter sports break on the excitement and speed of zooming down the slopes or a bobsleigh track or around an ice rink. They also showcased the traditional Alpine lifestyle, painting cozy Swiss villages with horse drawn sleighs on every street corner. And then there were the health benefits of the champagne air – then as now, high-quality spa treatments go hand in hand with a winter break – and all that exercise. Many of the buyers at the sale in London’s stylish King Street will be the owners of their own Alpine accommodation. Bars, hotels, restaurants, and for-rent chalets in the best resorts love these historic images that showcase the heritage of their properties to visitors. There are 70 lots up for grabs, and fierce bidding can push prices up towards a world-record high of £36,500 for a single poster. That was for a Russian-language poster – very much reflecting current trends in the luxury ski market. 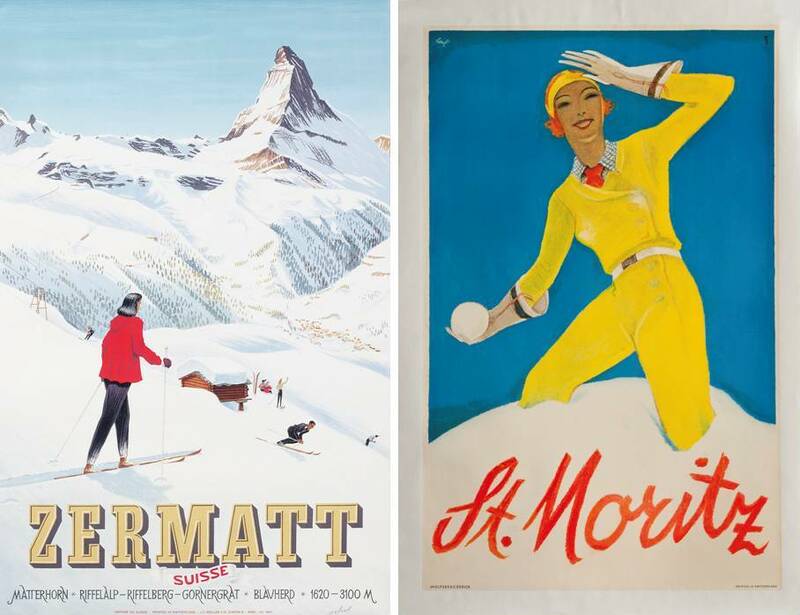 Last year’s top estimate was the £25,000 predicted for an image by Carl Moos produced to promote St. Moritz. Moos knew skiing inside out, though his own Olympic medal was awarded for the artistic competitions that were once a part of the games. Holiday advertising was a competitive world in the mid 20th century – your images needed to stand out in a crowded, colorful and very high-quality field. And, then as now, the skiing market was a luxury sector, with customers who demanded, and were used to receiving the best. They were also used to being at the cutting edge. 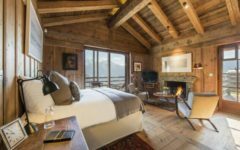 As this demanding clientele helped make Swiss hideaways like Klosters, Zermatt, Verbier and Gstaad; French mountain villages like Méribel, Megève, Courchevel, Chamonix and Val d’Isère, and St. Anton, Kitzbuehel, and Fügen in Austria into world-famous luxury travel destinations they did so with the best clothing, motor cars and entertainment technology. That means ski posters are hugely collectible. They are often striking works of art in their own right – the Art Deco period is particularly rewarding – and they are also social history. Look for not only hugely fashionable art styles, but also lifestyles that in their fashion, technology or even eroticism suggest that the client is well ahead of current social mores. 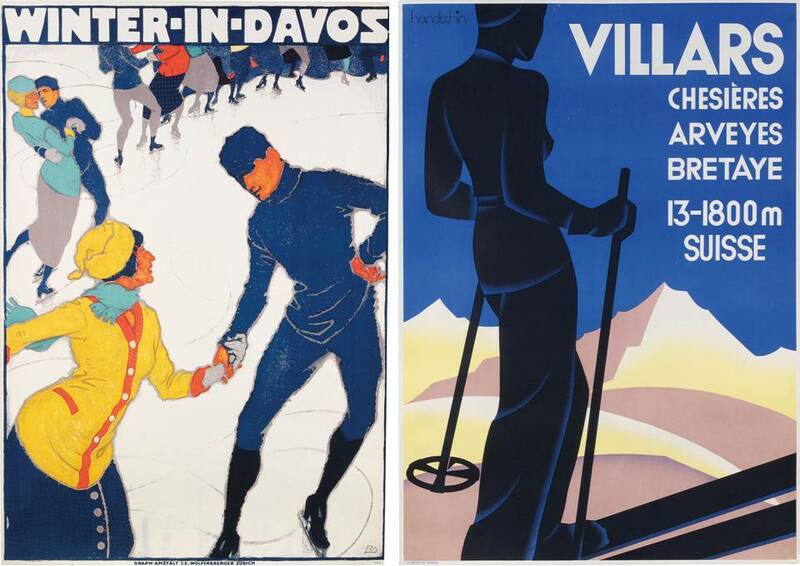 Demand for posters tends to follow skiing money, and Christie’s this year are highlighting images related to fashionable Davos, St. Moritz, Zermatt, Pontresina and Gstaad in the run up to the sale. The Valais region in Switzerland is also celebrated as ‘le pays du soleil‘. And that world record could be threatened! 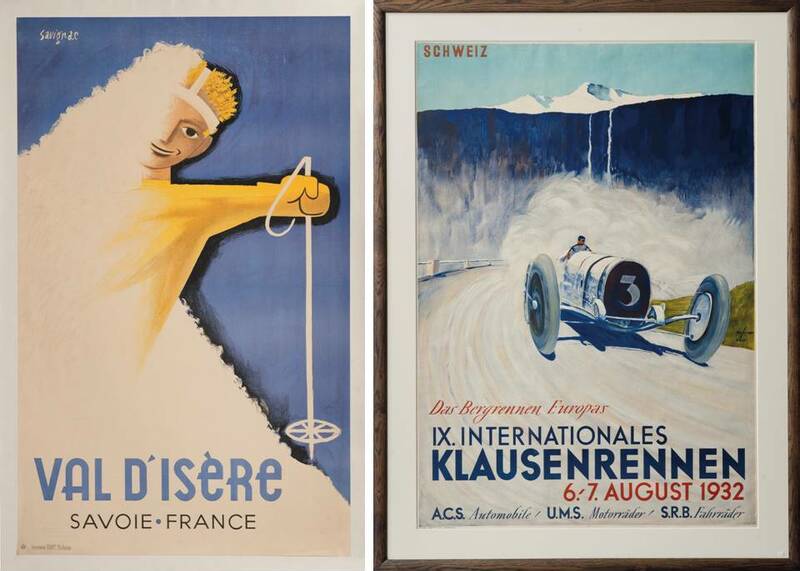 Lot 308, a poster advertising a motor race, the Swiss Klausenrennen Motor Race by Ernst Friedrich Schonholzer, 1932, shows a Bugatti swooshing through mountain landscapes – the perfect match of speed, style, and snow.